The Hydroventure 2 is an all terrain trail running shoe with a breathable waterproof eVent upper and Vibram MegaGrip outsole. It has Topo Athletic’s signature anatomical last and broad toe box. Its midsole is identical to the non waterproof Terraventure 2 we reviewed last year with title “A Well Balanced Buffet of of Stability, Rock protection, and Ground Feel”. The Terraventure 2 has a different Vibram rubber, XS Trek which is also used on the Ultraventure (RTR review). XS Trek is softer and bouncier than Vibram MegaGrip but with slightly less rock traction. Due to shipping issues (a box of size 10’s went missing on the way to Topo) our tester of the Terraventure 2 did not receive pair, so please refer to their review here for further terrain information and additional insights. Hydroventure 2 is a great option for all season waterproof performance on varied surfaces. In addition to running, the Hydroventure 2, due to its secure yet roomy upper and gaiter attachments is a great fast packer and hiking choice when wet conditions are expected. For drier conditions look to its close sibling the Terraventure 2. $140. Available now at REI here. General distribution February. Sam is the Editor and Founder of Road Trail Run. He is 61 with a recent 3:40 Boston qualifier. He runs halves in the 1:35-1:41 range and trains 30-40 miles per week mostly at moderate paces in the 9 minute range on road. He runs trails in Park City, UT in all seasons and in rocky rooty NH when he can out run the bugs. Jeff Beck is the token slow runner of the RTR lineup. As a middle-of-the-pack runner, his viewpoints on shoe and gear can differ from those who routinely finish marathons in three hours or less. Jeff runs 30 miles per week, both roads and desert trails, in North Phoenix, Arizona. He has a PR's of 4:07 marathon and 5K at 23:39 both he is working to demolish with help from his coach and fellow RTR tester Dave Ames. Jeff tested on dry dirt trails, slightly damp singletrack, as well as some roads to and from the trailhead. Sam tested almost exclusively on hard packed and deep powder snow in Utah while also running some steep downhills on road. Sam: Sleek, simple and elegant were the first things that came to mind when I saw the Hydroventure 2. Two gray tones and some red and black highlighting in the upper with a matching color red firmer layer midsole foam in the dual density midsole. The black outsole stands out it with Vibram branding on the lateral side. Jeff: Absolutely this is a Topo shoe. It looks like the performance model upgrade of their Ultraventure with lots of shared or at least similar lines and the waterproof upper is far more sleek. I’m guessing that Sam’s pair also came with a second set of laces, in bright red, but he opted to keep the black ones in place - but as a guy who owns a red car, mountain bike, and cell phone, you better believe the reds were going in ASAP. Sam: I’m sticking to the black laces! I was excited to try them on, and see how they breathed because mine was the review that should not have happened. Sending a pair of waterproof trail shoes into the desert (a solid six months away from the next monsoon season mind you) might strike you as odd, but due to a shipping mishap with a few pairs heading to other reviewers that experience more inclement weather going missing, my size was all that left to assist Sam. That said, the Hydroventure 2 fit true to size perfectly. Like all other Topos I’ve worn the toe box is big enough to spread my toes out without approaching anything clownish, and my heel is completely locked down. The eVent upper has a number of overlays, creating the firmest Topo I’ve run in, but that has to be a necessary evil to create the waterproof barrier. Sam: All Topo shoes have a unique natural foot shape last. 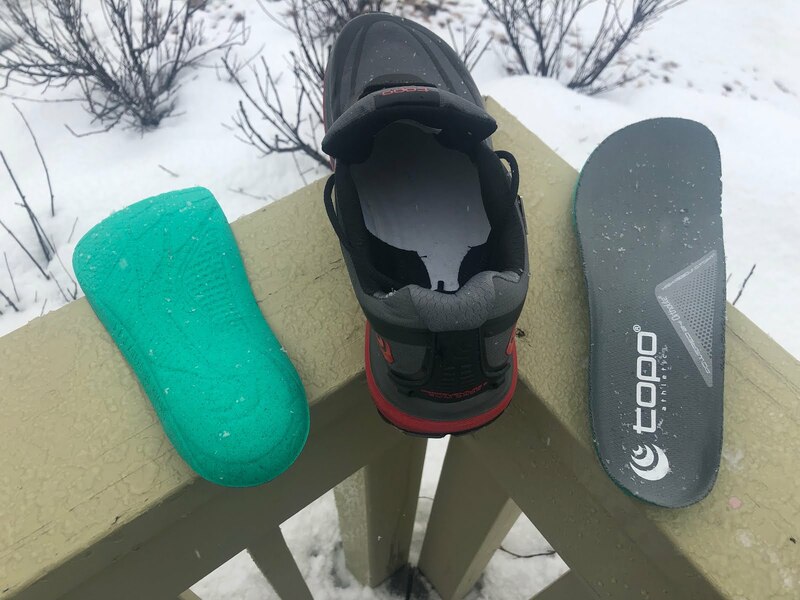 We visited Topo HQ in December where Topo Founder and CEO Tony Post showed us the difference between the Topo last and the last for a more conventional athletic shoe. The Topo last is not only more rounded and broader in the toe box but it is also less pointy and “shorter” as seen in the photo above. Not to worry, Topo are not too short they just get rid of what is essentially the dress shoe “style” look of the pointy front of the shoe. Underfoot instead of being “flat” the last is more rounded to conform to the actual foot shape. The flat profile exists as it is slightly easier to assemble upper to midsole and is a long time shoe making convention. At the heel instead of being vertical the last conforms better to the shape of heel bones. The more rounded and contoured shape can be seen in the Hydroventure 2 with the Ortholite sock liner removed in the photo above. Hats of to Topo for going the extra mile to shape their lasts to the human foot! The Hydroventure has an eVent DV dry LT upper which is waterproof and breathable. This type of upper is a three layer laminate as illustrated below. and finally bootie plus traditional upper can add weight and stiffness. I ran the Hydroventure in temperatures around 20 F and my feet were perfectly warm, dry, and comfortable although in deeper snow and for debris catching gaiters are recommended. It is outfitted with a fine 5mm Ortholite sockliner which should resist packing. The Hydroventure can be outfitted with the Topo Gaiter ($20). This very light Lycra gaiter is not waterproof but will keep out trail debris, As the ankle collar is quite low if conditions are really sloppy or loose debris will be encountered the gaiters are a good idea. You have to slip the gaiter on before the shoe but Topo tells us the next generation gaiter will not require removing the shoes. The rear of the gaiter has 2 hooks which attached into channels on the heel. The front has a single hook that attaches to the laces. I found slipping the second hook in not easy as the hook channel on the shoe is small. This to will be improved in future versions. Another way to get shoe and gaiter on is to attach the two rear hooks to the shoe, slip gaiter over foot pulling it up high on the ankle then slip on shoe taking care that the front hook is clear of your socks. Jeff: The upper is surprisingly breathable considering what Topo has accomplished. I ran in the shoe a number of times, unfortunately never encountering weather of any sort to test them against. My first run was windy and around 30 degrees (what Phoenicians refer to as “freezing”) but most of the runs were around 50 degrees and I didn’t have a problem with heat at either of the ends of the Arizona winter spectrum. However, I did find myself dealing with a number of small rocks that found their way into the shoe than with any other trail shoe. The lateral side does not go very high up the ankle, and I suspect that’s where they were finding their way in - a problem that could likely be completely fixed by utilizing Topo’s gaiters. As for a waterproofing test, my final run was predicted to be in the middle of a several hour rain, but unfortunately it showed up about five hours early. As a result, I took matters into my own hands and spent about two minutes literally hosing the shoes down before I headed out for five miles of singletrack. Jeff: I was a little concerned, because the toe boxes were both starting to soak through. I have a little experience with hydrophobic surfaces, and at first I thought they were going to full on repel the water, but it seemed to soak in some. However, very little, if any, moisture made it into the shoe. Editor’s Note: while the membrane is waterproof breathable, and will absorb very little moisture, the outer mesh if saturated can soak through making it harder for the membrane to keep and push moisture out. This is a common characteristic of all such systems. Jeff: Within 30 minutes of running, the shoes had dried out. I didn’t experience any issues out on the trail, though when I took the shoes off afterward I noticed that my feet were kind of clammy. I wouldn’t recommend soaking the shoes and heading out for an ultra, but realistically I wouldn’t recommend soaking any shoes before any run. But if you get caught in something out on the trail, I’d imagine the Hydroventure 2 would be the ideal shoe to have on your feet. Sam: The midsole is a injected dual density EVA with the gray/black layer under foot slightly softer for cushion and the red layer firmer for response. Injected EVA tends to have slightly more bounce than compressed EVA. It has the same midsole as the Terraventure 2 (RTR review). At a total stack of 25mm heel / 22 mm forefoot it has a solid well cushioned forefoot well protected from rocks and an adequate heel stack. I ran two steep downhill road miles after a knee deep powder snow slog up in Park City and found the cushion very adequate, suprisingly shock free and stable. It’s 3mm drop will make it agile. Jeff: For a shoe that appears so similar to its brother, the Ultraventure, their midsoles could not be more different. The Ultraventure has a higher stack at 30mm/25mm vs. 25mm/22mm for Hydroventure and is noticeably softer, while the Hydroventure feels substantially firmer, the product of the slightly lower stack, slightly firmer MegaGrip rubber and rock plate. However, and I can’t believe I’m writing this, I think I prefer the ride of the Hydroventure. The lower stack feels very secure, and the rock plate means I can run any of the incredibly rocky trails, and I don’t have to be as careful with each foot step. I’d probably limit it to a 15K or less, but lighter weight runners could likely take it even further. The outsole gets an upgrade to Vibram MegaGrip in a more aggressive wider spaced lug pattern. The very similar Terraventure 2, as the does the Ultraventure, have the slightly softer more abrasion resistant but not quite as rock adhering Vibram Trek XS in the same lug pattern. Each brand using MegaGrip develops its own lug pattern. Here Topo has chosen to prioritize ground contact surface area over lugs with many angles and particularly so upfront as illustrated in the side by side with the Speedgoat Mid below. 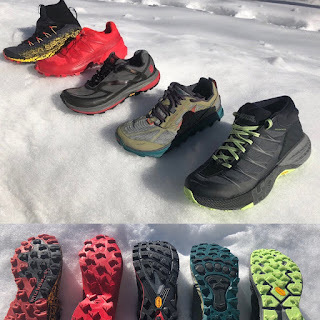 This should translate to good traction on rock and on other hard surfaces with a smooth run feel but as we found in our on snow test (see our five winter shoe round up article here) slightly less traction on climbs than more aggressively angled outsoles such as the Speedgoat’s. Jeff: Why fix what isn’t broken? Topo’s designers have happened upon an outsole design they clearly like, it is virtually identical to the Ultraventure. The Hydroventure 2 uses a stickier type of Vibram rubber, and its traction was fantastic. My final run, the one that started with the hose, was on slightly damp trails from a light rain that went on through the night (ending an hour before sunrise), and they chewed it up. The front of the Topo outsole reminds me of a toy from when I was a little kid. The Animal - a battery powered truck that grew claws out of each tire if it encountered any slippage. That’s not a bad thing, the Animal would climb anything, and the Hydroventure 2 does as well. Jeff: The Hydroventure 2 has a firm and agile ride. The rock plate gives it enough protection to take onto technical trails, and while I wouldn’t characterize the shoe as “plush” it is comfortable to run in. If they were able to add one or two more millimeters I think I would have enjoyed the ride slightly more, and the midsole is dense enough I don’t think that would have made it ungainly. My 10.5D weighed 11.6 ounces, but it doesn’t run heavy in the slightest. It wouldn’t be in my top ten road shoes, but if you have to spend some time on the pavement to get to the trail of your choice, it isn’t cumbersome in any way. Sam: The vast majority of my running in the Hydroventure to date has been on hard packed snow. The rock plate adds stiffness which on rocky terrain provides stability and protection but on snow when combined with the outsole design did not have quite the front uphill traction of more specialized soft ground shoes but nonetheless performed very well without additional traction devices. My steep downhill road test had me very satisfied with the firmer relatively shock free cushion, stability, and slight bounce. Sam: The Hydroventure’s eVent upper and its fit is secure with plenty of trademark Topo well held front room and no slop although I do think the ankle collar could be slightly higher. The upper and its pliable overlays do a great job of holding the foot without the usual awkward stiffness of waterproof breathable uppers. Its weight is highly competitive for a waterproof breathable trail shoe, in fact the lowest weight of the five winter and wet conditions shoes we tested. The rock plate and stout Vibram MegaGrip outsole combined with low drop can make it an agile rough terrain shorter distance, say up to 25K shoe for me. On softer ground, I would prefer more front flexibility up front and a more aggressive outsole lug pattern although lug heights here are fine and the outsole is at a very good any terrain compromise. I was pleasantly surprised by the Hydroventure’s well if firmly cushioned downhill road manners. I see this shoe as ideal for the often wet, rocky, rooty trails found in New England. It should also be a great choice for fast packing, hiking, and thru hiking and as a great all arounder if wet or cold conditions may be encountered. -0.15 for needing a bit more near the very front flexibility (while retaining rock protection, a tricky balance) and potentially a slightly more aggressive outsole pattern upfront for softer ground use. Jeff: Hydroventure 2 has a balanced and versatile stack and midsole geometry with a 3mm drop and a decent 22mm of forefoot stack with a rock plate. The midsole is dual density with the black/gray areas softer than the red. Its traction was decent on snow but not quite at the level of the others as its MegaGrip outsole has more contact surfaces than the others and is on the stiff side given its rock plate which on the flip side make it a strong candidate for rockier more technical terrain. The Hydroventure 2 has a superb upper, which by using effective overlays, and despite the stiffer(than non waterproof uppers) eVent, provides a smooth glove like fit, hard to do in a waterproof shoe. It has plenty but not so much toe box room that hold and security is compromised. It is the light shoe for a well shod and cushioned waterproof breathable trail shoe at approximately 11 ounces or about the same as many non waterproof shoes. Jeff: The Hydroventure 2 is the no-brainer shoe for a technical trail run when you know rain is coming. Far and away the best looking Topo shoe, it’s upper holds the foot very well, and is both breathable and waterproof. Its outsole, between the design and the Vibram rubber, has grip to spare, and the midsole (combined with the rock plate) provides solid protection against rocks and firm ground. It doesn’t over-do it, which gives the shoe a lot of confidence on the trail. Don’t be put off by the weight, it runs much lighter than it sets on the scale, and waterproof to boot. -.25 for collecting rocks inside the shoe. The only trail shoe I’ve run in that required me to dump out small rocks and stones mid-run every single time. -.25 just a touch firm for me, a hair more cushioning would have opened this shoe up for longer distances. Sam: Jeff and I did not review the Terraventure 2 but by specs they are very similar with the main differences being the waterproof breathable eVent upper ( and its lighter weight) with the Terraventure 2 also having the slightly softer bouncier Vibram Trek XS outsole while the Hydroventure slightly firmer more rock adhering Vibram MegaGrip. Jeff: The brothers fight and we all win. Both great shoes, the Ultraventure better for longer, smoother trails (the softer cushioning isn’t as effective combating rocks), and the Hydroventure 2 better for shorter, faster, more technical trails, also wet. Slight edge to the Hydro. Sam: Agree with Jeff and give the edge to the Ultraventure for its ability to cross over to firm ground and road with ease. So it comes down to what terrain types you will most often encounter. Far more cushioned with a high supportive high cuff the Speedgoat Mid WP has a yet more pliable waterproof breathable upper and a more aggressive for softer ground MegaGrip outsole. Not as agile as the Hydroventure, and heavier, the Speedgoat Mid is about as close to a running boot as I have ever seen. Stiffer it climbs a bit more awkwardly but descends like a monster truck. The Hydroventure will be faster and more fun on shorter runs while the Speedgoat will take you just about literally anywhere rough in highly cushioned comfort. A yet closer wacomparison we have not tested would be the Speedgoat 3 WP whose weight comes in at a heavier 11.4 oz. but more awkward and less of a piece on the foot than the Hydroventure’s. The midsole and ride of the Lone Peak is clearly softer and its rock plate more minimal making it more of a fast yet mellow terrain cruiser than the Hydroventure. Dial back the pace and it will do just fine on all terrain (after all it is the number one choice of thru hikers on the Appalachian Trail and PCT) but without quite the security and firmer more stable overall ride and secure fit of the Hydroventure. The traction of the Lone Peak is slightly more versatile, more rounded and effectively lower profile and very slightly out performed the Hydroventure on snow. Jeff: These two were shockingly similar to run in. The Wildhorse has a bit more cushioning, the Hydroventure has a better upper and toe box. Surprisingly, the Topo is a little lighter as well as being waterproof. Polar opposites in the wet, Hydroventure eats it up and Wildhorse is famously bad in it. Prefer the Nike, that extra little bit of cushioning works to improve the ride but not enough to make for an unstable one. I was really excited about the HV2, as it would be offered in a 14 (the OG stopped at 13). I felt that the shoe fit nearly a full size too large; I have owned multiple Topos and am a big fan of their snug midfoot + roomy toe box, but this one was just WAAY too loose throughout. Also, The upper, being somewhat stiff due to the waterproofing, creased and dug into my foot. I ultimately sent mine back.